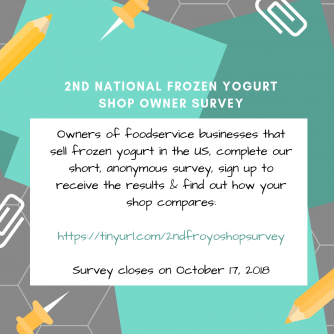 LOS ANGELES - Sept. 25, 2018 - PRLog -- The Second National Frozen Yogurt Shop Owner Survey, sponsored by the International Frozen Yogurt Association, is now open. The survey asks shop owners about shop performance, satisfaction with suppliers, operational practices, management, etc. Coupled with the National Frozen Yogurt Consumer Survey, the shop owner survey results will be used to better understand the frozen yogurt market in the United States. The frozen yogurt consumer survey closed on September 19, 2018. Anyone who owns a frozen yogurt shop or a business that serves frozen yogurt in the United States is invited to participate. Owners who take the survey will be able to sign up to receive the survey results. The results will help froyo shop owners better understand how their shop compares to other shops. This year's results will also be compared to last year's results. "We are excited to bring back the National Frozen Yogurt Survey and hope to see even greater levels of participation this year. While most of the questions are the same as last year's survey, we added a few questions based on feedback from last year's survey takers. Our comprehensive surveys of frozen yogurt consumers and shop operators offer insights that can't be found elsewhere. We are eager to see and share the results with others in the frozen yogurt industry," said Susan Linton, President of the International Frozen Yogurt Association. The survey will remain open until midnight PST on October 17, 2018. Those who are interested in the results who do not own a frozen yogurt shop can receive the survey results by sharing IFYA's pinned Facebook (@froyoassociation) post about the survey or retweeting the pinned survey tweet (@froyogirl).